Crassula ovata, commonly known as Jade Plant, is a tender succulent whose easy-to-grow and propagate nature makes it a common houseplant. 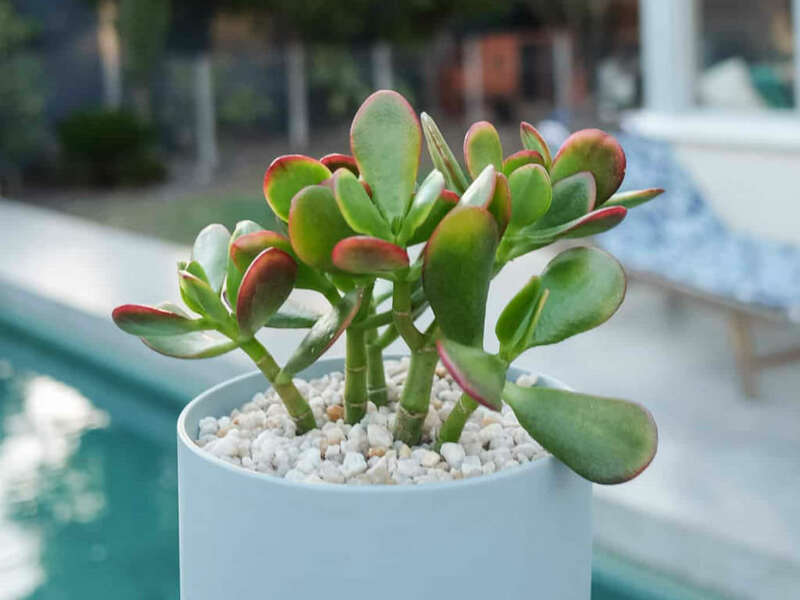 Although Jade Plant usually performs well in containers that restrict root space, is fairly slow-growing, survives under conditions of occasional neglect and enjoys the warm and dry environment typical of homes, the plant does have certain requirements. Various symptoms appear if these conditions are not met. If inadequate sunlight or fertilizing, overwatering or cold temperature exposures are responsible for the wilt, consider relocating the plant and adjusting the care regimen. If serious rot is occurring, consider transplanting or discarding affected plant parts and propagate healthy parts in new soil. Jade Plant prefer at least 4 hours of direct sunlight each day but is able of surviving in bright, indirect light. Inadequate light conditions cause a plant to develop deep-green leaves and drooping stems. The plant is not necessarily unhealthy but is not receiving the sunlight necessary for compact growth and red-tinted leaves. As succulents, Jade Plant prefers the soil to dry between deep waterings and should be watered most liberally during periods of active growth. Jade Plant should not be left sitting in water. Restrict watering during winter or dormant periods. Overwatering results in stem rot, collapse, and leaf drop. Treat Jade Plant with a suitable fertilizer every 3 months or so. If a Jade Plant was exposed to cold temperatures or frost, it may wilt. Jade Plants are generally tolerant to around 40°F (4.5 °C) and may survive brief freezing spells. If kept outside during the summer, bring them inside each year before the first frost. The ideal daytime temperature range for Jade Plant is between 65 and 75 °F (18 and 24 °C). The nighttime range is 50 to 55 °F (10 to 13 °C). The pathogen Erwinia attacks the Jade Plant. It causes the stems, branches to collapse, and makes interior tissues soft and mushy. Jade Plants affected by bacterial soft rot should be discarded.